I posted last week about Sony BMG’s upcoming move to drop DRM, but I had no idea it would take this form. Rather than sell individual tracks over the Web like iTunes or Amazon, Sony BMG will be selling plastic cards at retail stores like Best Buy and Target that represent the ability to download an album at MusicPass.com. Called the “Platinum MusicPass,” downloads will also include the types of bonuses you might expect when buying a CD, such as hidden tracks and videos. The recommended price for most of these cards will be $12.99. No… that can’t be real. Sony BMG can’t be that backwards. 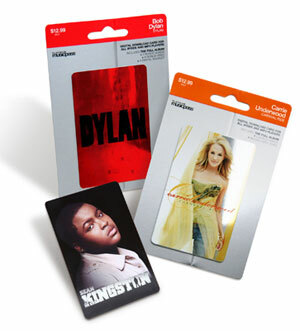 To get Sony BMG’s DRM-free music files, someone burns some coal to manufacture these petroleum-based plastic cards, then delivers them to stores on a series of diesel trucks. I drive to Best Buy in my 3056-pound gas-burning car and find my particular little plastic card, assuming that store carries the album I want in plastic-card format and it’s in stock. (If not, I need to drive to more stores, or just give up and try again next weekend.) But they probably have these cards taking up space somewhere in their massive store that requires tons of energy to keep well-lit and ventilated (since it has no windows). I bring my plastic card to a cashier: one of the few dozen unhelpful, unskilled, underpaid, undereducated employees who had to drive their 3056-pound gas-burning cars to work that day for the store to operate so they could earn just enough money after taxes to buy a few plastic music cards. I hand the cashier another plastic card from my wallet that serves no purpose except to hold a few dozen bytes and save the cashier the few seconds it would take to type them into the computer manually. Best Buy’s computer system contacts American Express’ computer system with those few dozen bytes, and the money is electronically transferred from my account to Best Buy’s. After tax, the plastic card really costs me $14.02, plus the value of the fuel and mileage on my car, plus my time, plus my increased annoyance from interacting with the employees and refusing their “rewards” program and magazine subscription solicitations. I bring the plastic card home, get back to my computer (where I actually wanted the music in the first place), and type a long, nonsensical alphanumeric string into a box somewhere on MusicPass.com, possibly after being required to register an account. Somehow, I download the files. This might require a custom software installation. It also might require manual importing of the files into iTunes, where I really want them. Sony wants me to think the plastic card is a “collectible”, but I don’t want the clutter. I have enough plastic cards in my life. All I really want is the music, which unfortunately the “collectible” plastic card doesn’t contain. So I throw away the plastic card, its cardboard backing, the receipt to prove to the guy at the door that I didn’t steal this plastic card, and the plastic bag to contain all of this necessary material. A diesel garbage truck eventually comes and transports them to a landfill. The cardboard backing and receipt might biodegrade eventually, but the plastic card and bag sit there forever. I click a few times and buy the album from iTunes or Amazon for at least $4.03 less and never touch a physical product.